The Buran shuttle OK-2.01 was moved yesterday (Wednesday 22) for the MAKS 2013. It’s in the Tushino region, East of Moscow, that the shuttle has been lying for years, this Buran shuttle of second generation wasn’t finished when the program was stopped in the beginning of the 90′s. Since then Molniya institute has been stocked it on a canal’s wharfage not far from the assembly factory. 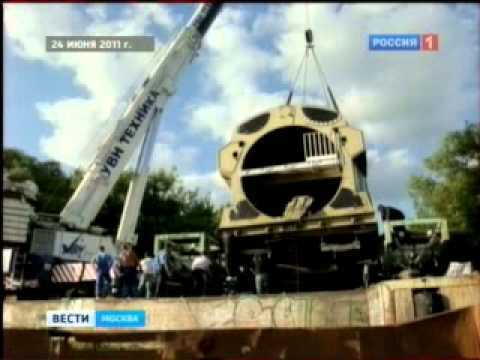 On Wednesday 22, June during the day the shuttle was put on a barge to be moved to the MAKS 2013 international air show, which will take place in the Zhukovsky town (Moscow region). The shuttle has arrived at Zhukovsky on Monday 27, June. Posted on: 2011-06-23 under Buran OK-2.01. Salut à tous! Chér Vassili Petrovich, pourquoi pour le MAKS 2013? J’ai lu ici: http://www.vz.ru/news/2011/6/22/501642.html qu’on va l’exposer à MAKS prochain. d’après ce reportage la rénovation de la navette va durer une année, elle ne sera prête que pour le MAKS 2013. I can’t wait to see it at MAKS 2011. Anyone know if I will be able to take pictures of it?